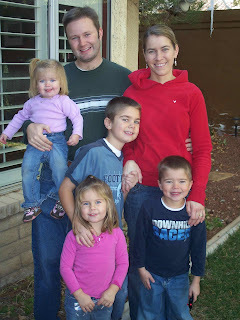 My brother Todd and his sweet wife Sharolyn and 4 cute kids came to visit this week. They came down to watch the BYU game last night. I feel bad, things were a little crazy while they were here! We had a train party here on Friday night and some friends for breakfast on Saturday morning... so it was nonstop entertaining! Crazy but fun! Ashley and I got to babysit the little girls Saturday night while everyone else went to the BYU game. We were brave and took them out shopping. I am not used to car seats and diaper bags! And we didn't have a stroller. So I let little Emily walk while we were in The Gap and she was reaching for some lotion on a glass shelf and totally fell, sending all the lotions and body sprays to the floor and since the shelf was glass, it sounded awful and she bonked her head on the shelf as she fell!! It was quite the scene!! Not a very good babysitter. I felt SO bad. She was a tough little girl and only cried for a minute. I envisioned us running to the emergency room for stitches! So after that we took them to Jason's Deli for dinner and had some ice cream. That always makes things better! In all of our shopping, we did find a new comforter for Ashley's bed. She wants her room redone for her birthday. It was so fun to have family here! I miss them all so much, especially this time of year. 3 tired girls after a long night of shopping... watching Finding Nemo. Mitchell couldn't stay on his feet! Mitchell finished up his fall soccer season today. I always enjoy soccer season, but I must admit that I am always happy when it is over. It was pretty cold out there today. Mitchell played good today... he was a bit tired though, 8:00 am is a little early for him. He was become a great soccer player over the years. He is excited to be in high school next year and try out for the school team. Down he goes one more time! We are off to the Sunburst Shutters Christmas party. It is a bowling party! We will let you know who wins. **update** I beat John by one point! Not sure what the kids scored?? But it was fun. I took the kids to see Santa for the 17th time yesterday. I just hung the new picture along with the other 16 Santa photo's on the wall. I just stood there and looked at them for like 10 minutes. It is amazing how time flies. It seems like yesterday that I celebrated Christmas by giving birth to our little Ashley. That was an amazing day, one I will never forget. It was snowing like crazy and she was early and I was so scared! But all went well, and I remember so clearly holding my new baby, looking out the hospital window watching the snow fall! Beautiful!!! I must say that seeing Santa these days isn't quite as exciting as the days where they "believed". No fun! All they want is real expensive things now! I miss the days where they were thrilled with the little Barbie and toy cars.... I guess now it's a new kind of fun! Merry Christmas! 3 more things to cross off my to do list.... YAH! I am feeling really good! I think this is the earliest that I have ever gotten my Christmas cards done. They are ready to pop in the mail tomorrow. We always do a little collage of photo's with a theme and it usually takes me a long time to remember how to use the Photoshop Elements program to get it done, but this year I remembered the program and I got it done in a week instead of 2. How was that for a long sentence?? I am not a writer, I hated English class! Last years snow globe Christmas card took forever. And John got the train set done last night. This is definitely the earliest that has gotten done! It looks great. He decided not to do an "I spy" this year, but do a "find what's wrong with this picture" theme. He has a bunch of things wrong, like a lamp post coming out of the sky, and cars going the wrong way and the best thing is that he made a volcano in the middle of a neighborhood. He put's dry ice in it and it looks totally real... very cool. We had our first little train party tonight and had the Jarman's (John's boss) over for dinner. The twins absolutely love it! They ask John all year whenever they see him, if the train is up yet. They were pretty cute. Here are couple of pictures of it...see the KFC bucket rolling down the street?? We also got our Christmas lights up. John taught Mitchell how to do it this year, so hopefully he can do it next year all by himself. So, I am getting closer to being ready for Christmas! I have a lot of shopping to do, but that is fun! Off to the mall!